It's that time of the year where we are reminded to give thanks for our blessings. 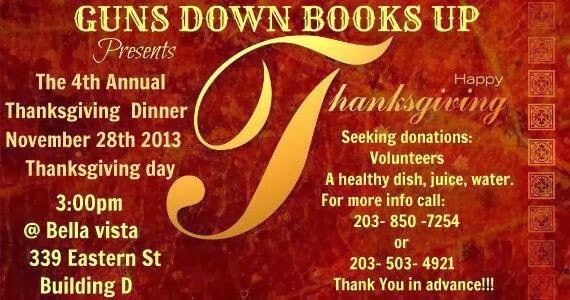 Guns Down, Books Up is a local nonprofit taking an extra step to give thanks by providing its annual Thanksgiving Day Dinner for those in need. 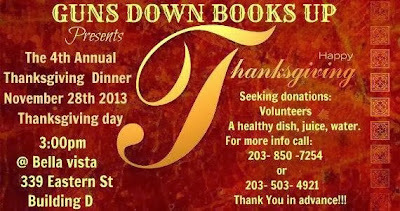 Guns Down Books Up is calling for dinner donations, i.e. a healthy dish (click for some ideas), juice, water. If you're available and looking for volunteer opportunities, get in contact with the coordinator at 203-850-7254 or 203-503-4921. This event takes place at 3pm in Fair Haven. I had the pleasure of meeting Raymond, the head of Guns Down Books Up, at a couple of events over the past year, and he is a passionate and dedicated leader in the New Haven community. I would recommend working with Raymond and his team if you can! 203-850-7254 or 203-503-4921 for Donation/Volunteer Inquiries! !